Before I start today's post, I want to remind you all that tomorrow is the first What's New With You Link-up! I would love a great turn out to my first link-up party, so I would appreciate if you stopped by tomorrow. If you want to learn more, check out the post here! I'm so excited to share a new recipe with you all today. I've been enjoying these simple and delicious egg cups during my Whole30, and today I'm going to be sharing four different varieties. I think that these are all unique and there's an egg cup for any type of palette and cuisine- from Italy to the Mediterranean and back to America. I hope you all enjoy trying these different varieties! All of these recipes follow the same basic recipe, which I'll share first. From there, just add in the other ingredients and throw it in the oven. I made all of these at the same time, so feel free to mix it up and make multiple varieties to keep your breakfast exciting! Grease a 12-cup muffin pan with coconut or olive oil. In a bowl, mix together eggs, coconut milk, salt and pepper. Add in any other ingredients mentioned below. Divide up eggs evenly among the 12 cups, filling about 3/4 of the way full. Bake about 20-25 minutes until eggs are set, and a toothpick comes out clean. To remove, run a knife around the edge. Eggs should pop out easily! Cold pizza is a popular breakfast (especially in college), so let's take those flavors and throw in some eggs and make it healthier! These cups are delicious, nutritious, AND easy to make. Delizioso! Mix together spices, add to egg mixture. In a pan, cook the mushrooms about 8 minutes until lightly browned, and moisture is drawn out. Add black olives and stir to combine. Remove from heat. Divide the mushrooms and olives evenly among muffin cups. Pour in eggs, and cook for 20-25 minutes. When eggs are almost done, add one tomato to each cup (cut into quarters). Allow tomatoes to cook for about 2 minutes. * Don't like black olives or mushrooms? Just substitute your favorite pizza toppings! Not only is this egg cup delicious, but it has Mediterranean flavors that will transport you to beautiful Greece. I love using spinach as a healthy base for the other varieties as well- feel free to mix and match flavors! In a pan, saute spinach in olive oil until wilted. Add spinach to egg mixture and stir to combine. Divide mixture evenly among muffin cups. Top with chopped olives and tomatoes. * This would also be great with some proscuitto! I love going to diners for a delicious breakfast, but it's not exactly healthy. This gives you the same flavors minus all of the grease and expensive bill! If you want to make this even healthier, you can substitute turkey sausage or small pieces of turkey bacon! In a pan, cook the hash browns in olive oil, stirring occasionally, until potatoes start to brown, about 10 minutes. In the same pan, cook crumbled sausage until browned. Separate sausage into cups on top of potatoes. Pour in eggs, and cook for 20-25 minutes. * You can also use tater tots as the base of the egg cup if you're not on Whole30! Who doesn't love bacon in the morning? These little bacon cups are so savory and delicious, topped with fresh and bright tomatoes. Did you know that the BLT was voted favourite sandwich in the U.K.? Cook bacon for about 2-3 minutes on each side, making sure it doesn't get too crisp or crunchy. Remove from pan and drain on paper towels. In the same pan, cook onion in bacon fat. Remove from pan and drain on paper towels. Take one slice of bacon, and wrap around the inside of a muffin cup. Repeat with the rest of the bacon. Add onion to egg mixture, mix, and divide evenly among muffin cups. Cook for 20-25 minutes. Remove from oven, and add a scoop of diced tomatoes to each cup. * Whole30 compliant bacon can be hard to find, so feel free to substitute prosciutto. A "POT cup" doesn't sound quite as good though! What do you like to add to egg cups? Do you have any quick and easy breakfast tips? linking up with: Delicious Dish Tuesday, What’s Cookin’ Wednesday, Full Plate Thursday , Thinking out Loud Thursday, FoodFriDIY, Foodie Friday, and the Weekend Potluck. Egg cups were a thing this past month for me since eggs is basically all I could eat for breakfast haha! These all look so good! These look so good! I'm eating my deconstructed version of this now and I swear I never get tired of it! 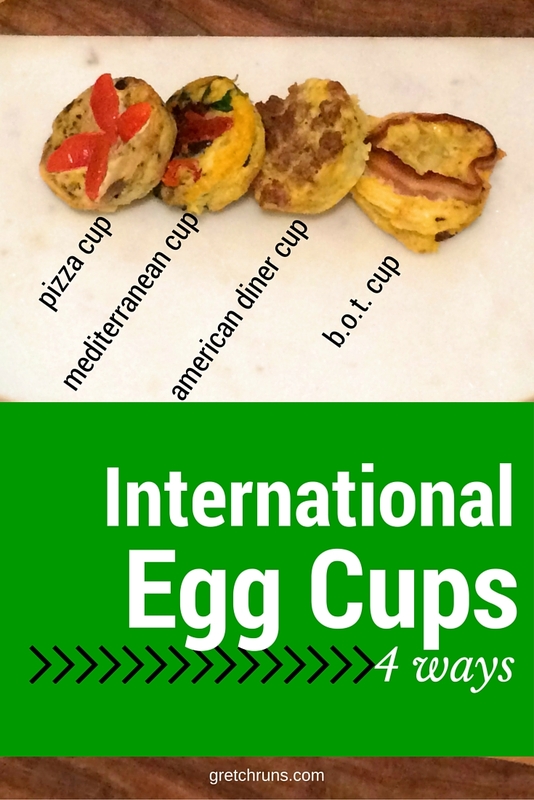 Egg cups are so easy and I do them when I have to cook breakfast for a lot of people. Especially if I can do it the night before. I need to try the Mediterranean version! That sounds great! I never used to have eggs for breakfast and now that's what I have practically every day. LOVE egg cups! such a great easy healthy breakfast! thanks for these options! Love the flavors and love egg cups! These looks so good! I thought I would be obsessed with the pizza one, but the B.O.T one is calling my name! My husband loves eggs cups, but I am still learning to enjoy them. These will be great to add to our collection. I typically make them is a few leaves of spinach and Old Bay seasoning. I remember that you don't like eggs! I like your version though..that sounds great and simple. they look so cute! or is that a weird observation? hehe. great ideas. I was going for cute, so thanks! YAY!! I hope she likes them! Love this idea! It's so quick and tasty. I wonder if my kids will go for it? How easy would that be to make for them before they all rush out the door! I hope they end up liking them! They're seriously so easy to make..even making 4 different varieties I was done in less than an hour total. I love making egg cups. I like to make a batch of them and then re-heat them for breakfast during the week! These look really cute and delicious. I love eggs so these look easy to make and simple for snacks. They're great for quick fuel before a run! Yum! That mediterranean cup has my name all over it! i love how versatile these are. when i make these, i love to throw mushrooms and spinach in, but KC likes his with bacon lol. i prefer smoothies for breakfast, and if you prepare the ingredients the night before, they only take a couple minutes in the morning! Those sound great! I like smoothies too, but I wake up so early and live in an apartment so I don't want to wake everyone up! Yum these look good, especially the BOT egg cup! What great ideas! Got to try these variations. Thanks Diane! They're quickly becoming my favorite too! I'm all about those hashbrowns!! Love that you use coconut milk as the creamer. It was a great addition I think! Yummy! Egg cups sound really good. I would love to try these sometime. Thanks Emily! I hope you do try them! I love your cups, awesome recipes! Thank you so much for sharing with us for our 5th Anniversary of Full Plate Thursday! Hope you have a fantastic week and hope to see you again real soon!